I’m already a big fan of MOG, so it was a treat to be invited to a special CMJ show sponsored by the music subscription service. 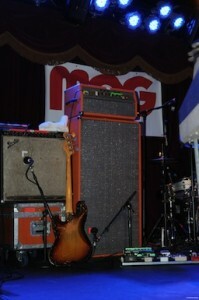 The event was held at Brooklyn Bowl and featured The Screaming Females, DOM and much loved Yo La Tengo. Though MOG began as an online social network to help music fans share their likes and discoveries it has in the past year expanded into a full fledged music delivery system. For the nominal fee of $5.00 a month ($10 to be mobile) you have legal access to the continuously growing ocean of music on their servers These are not 30 second snippets from which you must choose to purchase, this is fully streamed tunes and albums. What I find most rewarding about the MOG site is the ability to experiment to my heart’s delight. MOG effectuates its social origins to offer “moggers” playlist building and sharing options, as well as Facebook style friending of those who share similar tastes should they choose to do so. The “radio slider” on its player allows expansion of artists you’re hearing based on ID tags, therefore upping the likelihood you’ll find something new to enjoy. Most importantly MOG offers the mobile user the ability to download as much music as their device can fit for those instances when connection is impossible or impractical, like when I’m driving through the Brooklyn Battery Tunnel on the way to a concert. At this moment in time that is the clincher, the “cake-and-eat-it-too” feature, that makes MOG the best choice of current subscription services. So thanks to the MOG folks for creating a way for me to continue to feed my ravenous music appetite without welcoming a visit from the producers of “Hoarders”, thanks for turning me on to the Screaming Females (a band I love today which I did not know on Monday) and thanks to Abigail of MMN for the invitation and kind greeting. Yes, we really are considering MOG 6 month starter subscriptions as Christmas presents.